These are not the novels that are driven forward by action…the yearn to know what will happen next. Rather, these are novels that I can’t put down because I just can’t stop reading about these characters. But, the end result is the same as an action-oriented page turner. I flew through the pages…no matter how many there were (and some of these are LONG books). 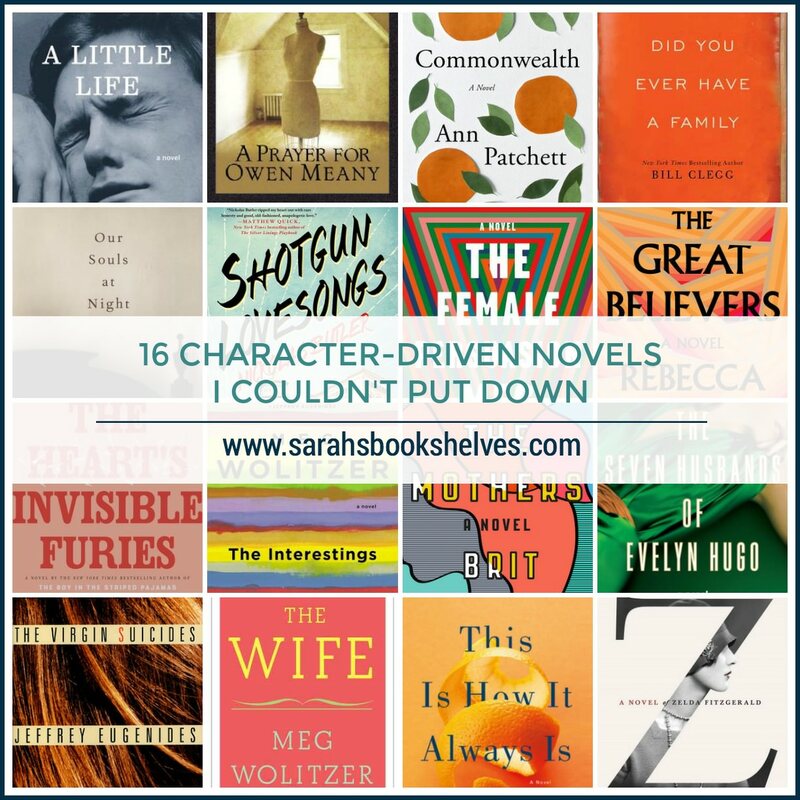 As I was putting this list together, I realized how many of my very favorite books were on it…leading me to realize that character-driven novels I can’t put down might be my favorite type of book out there. Part of the allure is that character-driven novels can easily feel slow and boring. It’s rare to find a character-driven novel that grabs you so hard you can’t put it down. 9 were on my Best Books of the Year lists (and another two will probably make this year’s list). 4 gave me big enough reading hangovers to qualify them for the Alcohol sides of my Alcohol & Advil posts. 10 have a spot on my real life bookshelves…which are (surprisingly) not very crowded and only my very favorites make it onto the shelves! This post contains affiliate links (plus: here’s your Amazon Smile-specific affiliate link ). An oral history of a fictional 1970’s rock band that felt so real I kept forgetting it was fiction. I’m predicting this novel will be my #1 book of 2019. The story of the Skinner family – the four Skinner children, their father’s unexpectedly passing in his thirties, their mother’s years long depression (which the children call “the Pause”), and how their lives unfold into adulthood. This dysfunctional family novel focused on family dynamics, reminded me of Ann Patchett’s Commonwealth (my review), and was my first 5 star book of 2019! The story of an author who is single-mindedly focused on becoming world famous (despite having trouble coming up with story ideas) and will use anything and anyone to get there. This book features one of the best villains I’ve ever come across in fiction. Spanning 30 years, the story of four male friends (Willem, J.B., Malcolm, and Jude) trying to make their way in New York City while dealing with the implications of Jude’s tragic childhood. During a Little League baseball game, Owen Meany kills his best friend’s mom when his foul ball hits her in the head…and this is the story of their journey from there. An ill fated christening party is the catalyst that ruins the Keating and Cousins marriages…and creates a blended family trying to navigate their new world. The story of June Reid, who loses her entire family (her daughter and her fiancee, her boyfriend, and her ex-husband) in a horrible tragedy on the night before her daughter’s wedding. A sweet, calm, and uncomplicated novel about two older people (Louis and Addie) who stopped caring what everyone else thought and did what they needed to do to be happy. Four childhood best friends from the small town of Little Wing, Wisconsin reconnect at a wedding and try to find their places in the adult world. A story of the simmering dynamics of a string quartet and that explores the implications of having an essentially business relationship that supersedes all other relationships in the members’ lives. Greer is a shy college student still in love with her high school boyfriend when she meets Faith Frank, an icon of the women’s movement, who changes the trajectory of Greer’s life. A group of gay friends and their female friend (Fiona) navigate the AIDS crisis and deal with the death of one of their own in 1980’s Chicago…and decades later, Fiona sets out to Paris to find her estranged daughter and encounters the past in the process. After Cyril Avery was born out of wedlock to an Irish country teenager and given up for adoption to a wealthy, Dublin couple, he wrestles with his identity and how he fits into the country of Ireland over the course of his life. Jules Jacobson becomes best friends with five teenagers at a summer camp for the arts in the 1970’s, remaining friends despite completely different experiences in adulthood. While seventeen year-old Nadia Turner is mourning the shocking loss of her mother, she starts a relationship with Luke Sheppard, her pastor’s son, resulting in an unwanted pregnancy. Legendary film actress Evelyn Hugo recruits young journalist, Monique, to write her life story, including the stories of her seven marriages. In a Detroit suburb, the five enigmatic Lisbon sisters commit suicide over the course of a year and the neighborhood boys who were obsessed with them try to understand why. On a flight to Helsinki to watch him receive a prestigious literary prize, Joan decides to leave her famous novelist husband, Joe, after a decades long marriage. When Claude, the youngest son of a family of five boys, starts to realize he wants to be a girl, the family must learn how to best support Claude and adjust to the situation. A family drama / love story…involving a Hollywood actress that the world had presumed missing and an American divorcee on the run from his problems. It feels like an epic, but reads easily. The story of Zelda and author F. Scott Fitzgerald’s relationship as told from Zelda’s fictional perspective. What character-driven novels have you not been able to put down? I did love a couple of those but generally character driven novels aren’t my jam. I hear you – they don’t work for everyone! Great list, Sarah, and I’d have to say i totally agree with you on your choices. Good character driven novels are the best. The only two I haven’t read here are Shotgun Lovesongs and Our Souls at Night. Judging by how much I loved the others, i should get to those two ASAP! I think you’d love both – and Our Souls is super short! You could read it in an afternoon. I’m glad that so many of these are on my TBR list. I like character-driven stories. I read A Prayer for Owen Meany when I was in high school. I still remember a lot about it, even though that was a LONG time ago. It’s been a long time since I read it too – definitely due for a re-read! YES character-driven stories! They’re my favorite kind of books. Most of these I’ve already read (The Virgin Suicides is my all-time fave!) and I’m adding the ones that weren’t already on my TBR to it! Not surprisingly we have several of these favorites in common! A Little Life tops my list and is still my favorite book ever with Heart’s a close second. I do think I’m more partial to character driven books when it comes to what stays with me the most. Great post! I thought A Little Life and HIF had a lot of similarities! Yes! Our Souls at Night!! Shotgun Love Songs and Z!! Great list–I’ll be giving some of these others a try. This is such a mixed list for me! Some are all times favorites, some I couldn’t make myself even finish! And I’m still too scared A Little Life will just ruin me. Also, you’re so good at bite-sized summaries! I always go on forever even when I try to keep it short. It’s definitely a doozy! Which ones couldn’t you finish?! I’m curious! Ha – I’m sure you have! I have two of these novels on my TBR, The Heart…and Z. I have to expand my general fiction tastes. Next year, per your endorsement, I will be reading The Heart Invisible Furies. I prefer plot-centric books with good to great character development, but I haven’t really thought whether a character driven book is that important for me or not. I think HIF is a great place to start. One of the best characters I’ve read in ages. Nice list, though a DFN’d at least one of these. Others, though, are also favorites of mine. I generally like character-driven novels. I’m curious…which ones did you DNF?! OMG – then you definitely need to read Shotgun Lovesongs! I read 9 of these and loved them all. Character driven novels are my thing! I love character driven novels, so I’ll definitely be referring back to this list at some point. Great post!! I’ve enjoyed eight of the ones you mention…so I’d better pick up all the rest too! I like how you’re gradually chiselling out this picture of the books you love the most. 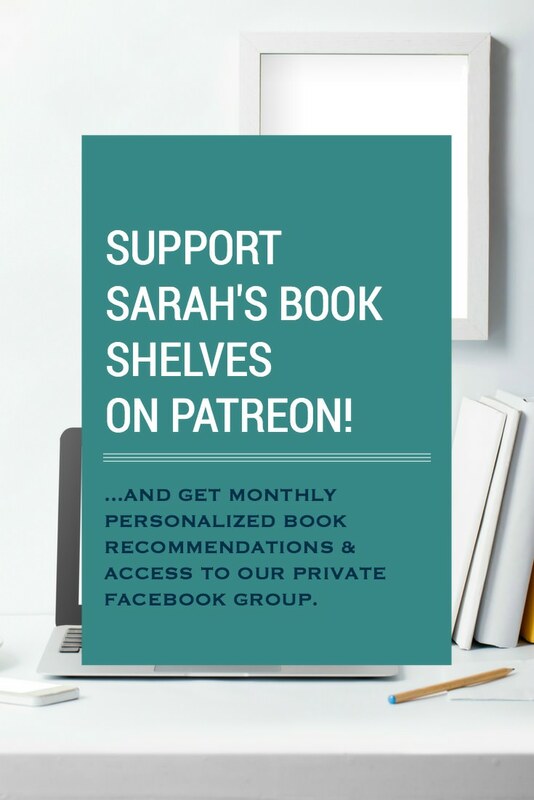 It should help you when picking out books in the future? That’s what I’m hoping! Trying to look for patterns every which way! So many of these are on my TBR! And I absolutely loved Commonwealth, The Mothers, The Seven Husbands of Evelyn Hugo, and Z. I generally love character-driven novels, but I have to be in the right headspace for it. The Virgin Suicides is on my Fall TBR list; I’m excited to read it after hearing about it forever. Virgin Suicides would make a GREAT Fall book! It’s got a bit of a spooky vibe. I’ve read almost every book on this list and loved most of them. They are the books that stand apart from other good books I’ve read. A Little Life, Owen Meany, Commonwealth, Our Souls at Night and Hearts Invisible Furies were supestar books for me. Now I need to add Shotgun Lovesongs (for me the cover did it no justice in wanting to read it), The Great Believers and Z. I’d love to see more of these listed since they seem to be what I need when it’s more than a page turner I’m after.